Changing your diet can feel overwhelming, especially when transitioning from the SAD (standard American diet) to a plant based diet. Even when you have the best motivation (your health, the lives of innocent animals, our precious planet etc.) and intentions - sometimes it can be really easy back to fall back to our old ways. We've all been there, myself included! I wanted to share some easy and accessible tips to help anyone transitioning to a plant based diet, reducing their intake of animal products, or even those of us just trying to eat a little healthier! 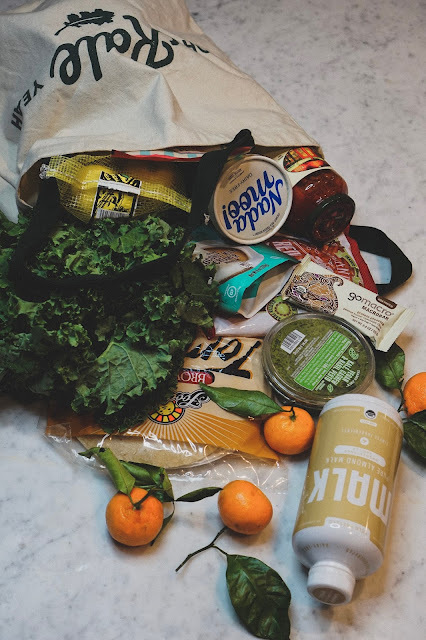 These products can be great to swap out for old favorites, to create quick, healthy, and nutrient dense meals and snacks! I've broken it down by meal to illustrate how we can make healthy changes/additions all day! The beginning of the day could feasibly be one of the easiest to swap out some healthy, plant based options for your old standbys! Need creamer in your coffee? Me too! Milk in your cereal? I get it! Going dairy free doesn't mean going at the expense of your morning faves. Promise. I've tried quite a few non-dairy creamers, and IMHO, coconut creamer delivers the best results. No, it doesn't necessarily have a coconut flavor, but it does offer the creaminess and viscosity that you would expect from a dairy creamer (without the coagulation that almond creamers can sometimes produce). I would recommend looking for one that doesn't include added sugars or carrageenan. In regards to a milk replacement, I prefer almond milk. Not your thing? It's nearly 2018 people - there are SO many options! Rice, soy, hemp, cashew, macadamia...you name it, someone has likely made a milk out of it. Just try and find options with as simple of ingredients as possible. Powdered Creamer: Coconut Cloud - this is great to keep at your desk! This is another great coffee addition, that offers more nutrients than standard white sugar (which is also usually processed using animal bone char). You'll see a big trend here is eliminating dairy - think about how much dairy we consume first thing in the morning. Dairy is SCARY guys! Aside from the cruelty aspect, it's extremely congestive to the body, and definitely not something we want to be weighing ourselves down with in the morning. This goes for protein shakes as well. Whey protein (dairy derived) is a super popular choice and heavily pushed in the 'healthy food' world. It's really not healthy at all, and luckily there are so many healthy, non-clogging protein options out there, you don't have to skip out on your favorite grab and go morning meal! You should really have it engrained now - no more dairy! Swap out your cows milk yogurt for a delicious coconut (again, doesn't taste like coconut) or almond based option. I love having this as a morning snack after my Every Day Green Smoothie with my favorite sprouted granola. Again, we want to avoid yogurts with added sugar and carrageenan. So many companies try and tout their protein bars as healthy, bun in reality they are full of nasty things like artificial sweeteners, dairy, and chemicals (how is this ok people)?! Luckily there are good, relatively clean, plant based options out there. I don't recommend using protein bars as an everyday snack or meal replacement, but I do find them convenient to keep on hand (I always have one in my purse) for when hunger strikes at an inopportune time! Lunch can be more challenging for people. Typically we need something quick, easy and filling to get us through the afternoon. Salads don't appeal to some people, this can be especially true in the winter months. Below are a few easy suggestions for both DIY and store bought plant based lunches. I LOVE these Food For Life Brown Rice Wraps. They are super convenient to keep on hand at home or the office, for quick, easy lunches. Heat them for a few minutes in a dry pan, or a toaster oven (not too long or they'll get brittle) and add your favorite toppings! I like hummus, avocado, shredded cabbage and sprouts. Add a drizzle of sriracha and a sprinkle of hemp seeds, you've got one awesome wrap! Smash black beans, salsa, guac and a sprinkle of nutritional yeast - Mexican wrap baby! My vegan kale Caesar salad is also great in a wrap - as is really any salad. Get creative, the possibilities really are endless. It doesn't have to be complicated to be good and good for you. Dinner might be the hardest time to wrap your head around not including animal protein in your meal. It is ingrained in us at an early age the animal protein + a starch/carb + a veg = a meal. We're now having to rewire our brains to think differently. Eliminating animal protein does NOT mean you'll be protein deficient. Protein is abundant in a whole foods plant based diet, and luckily it's a lot less calorically dense and much more bioavailable than animal protein! The combo below is my favorite for a quick, delicious dinner that is high in protein and nutrients. Lentil pasta is a great swap for standard wheat pasta. It is naturally gluten free, has great texture and flavor, and is full of plant protein! Just one serving has 13 grams. Boil some noodles and add your favorite homemade or jarred sauce (mine is Rao's Tomato Basil - omg is it good) for a quick, but nutritious dinner in literally minutes. Another awesome addition to your easy swap repertoire is a non-dairy pesto. With the amazing options out today, you'll never even notice the cheese is missing! I love to pair this with lentil pasta, and white beans for a simple dinner, or it's great as a crostini topping for an easy, crowd-pleasing appetizer. Ok, we can't forget dessert. I do my best to avoid refined sugar, so keeping my freezer stocked with some Coconut Cacao Truffles is best case scenario, but sometimes the need to indulge arises. For those occasions I usually turn to coconut ice cream. I guess you've gathered by now that coconut milk is a REALLY good cow's milk replacement. Try them and tell me they're not as creamy, delicious and satisfying as any dairy ice cream - do it! I dare ya! You're so welcome Janet, thanks for visiting!